Onesie feels sad and small until he learns about his odd job determining if the number of cubes that make up all of the cheese in his neighborhood is even or odd. Onesie's good neighbors, Tenor, and Hund-Red, demonstrate why it cannot be their job, and Onesie employs his newly acquired skills when the mice receive the Cheese Census in the mail. What will Onesie determine for the 999 cubes the mice possess? 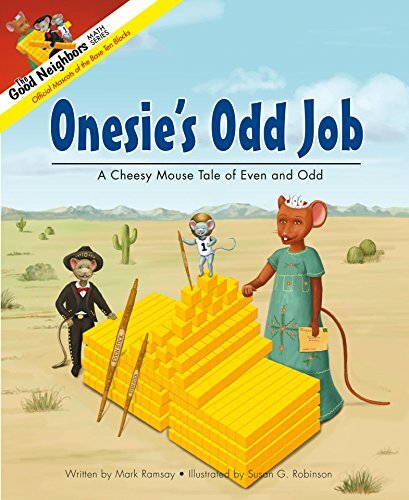 Through this engaging story, children not only learn the definition of even and odd numbers, but also learn why the ones place determines if a number is even or odd. The colorful illustrations provide children with base ten block visual models of even and odd numbers, as well as a deep conceptual understanding of what makes numbers even or odd.